Who says a small garden can not be beautiful? 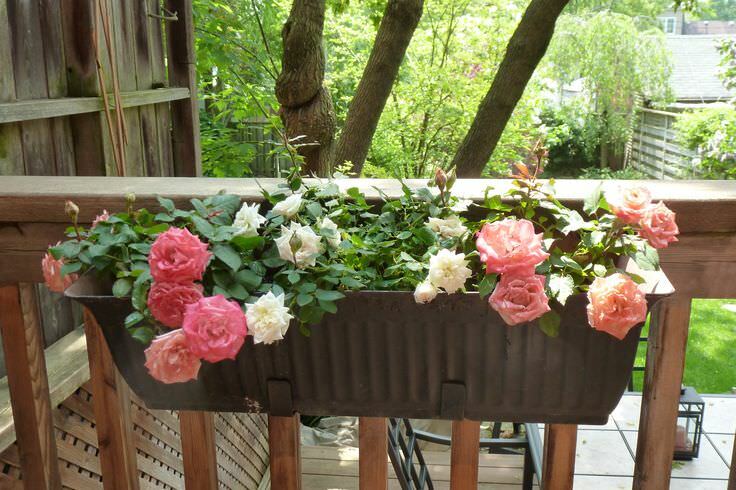 See the charm these potted roses are adding on this balcony garden. Blooming roses are among the most beautiful ornamental plants that can be grown in the garden. It is hardly surprising that many rose lovers that have limited space also desire to grow them. 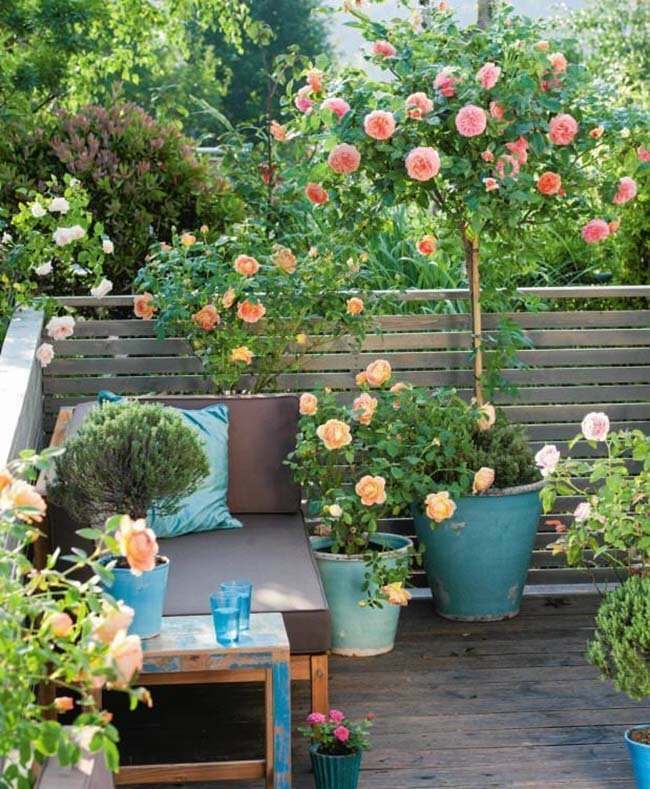 Fortunately, growing roses in containers on a balcony, patio or terrace is possible, this way you can create a small rose garden. Except large variety of roses, you can grow all type of roses in containers. Roses are one of the most diverse plants on our planet. There are 14, 000 varieties of roses of which some can withstand the – 40 F extreme cold temperature then there are some rose varieties suitable for tropics that bear up to 110 F and still blooms. Choose roses wisely, according to your climate. 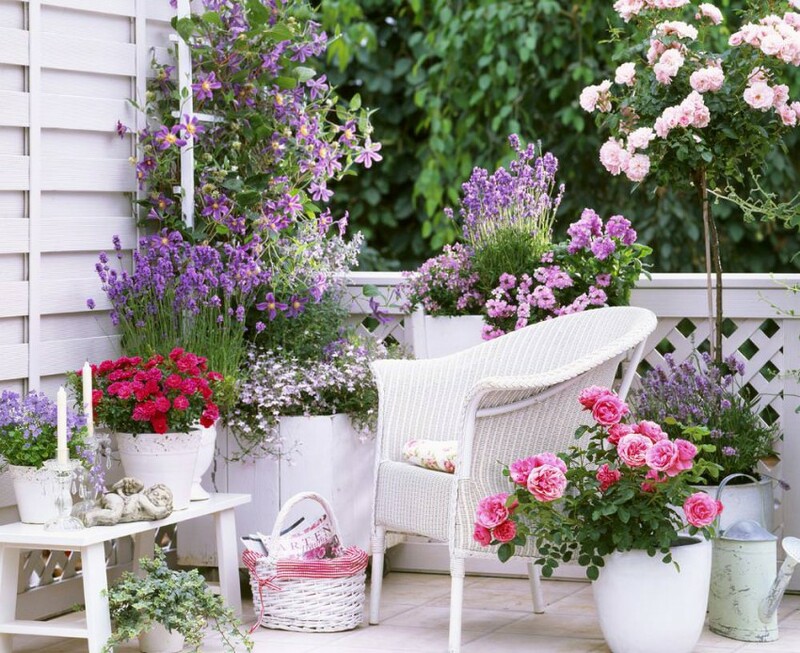 You should also consider the space you have, decide whether you want to grow a small rose garden or just a few roses. Miniature Roses are comparatively easy to grow than all other rose types, they are simply the mini version of large roses and are ideal balcony roses, and good for roofs and patios. 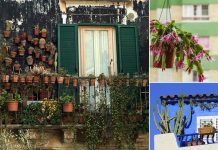 You can also grow them in hanging baskets and railing planters. 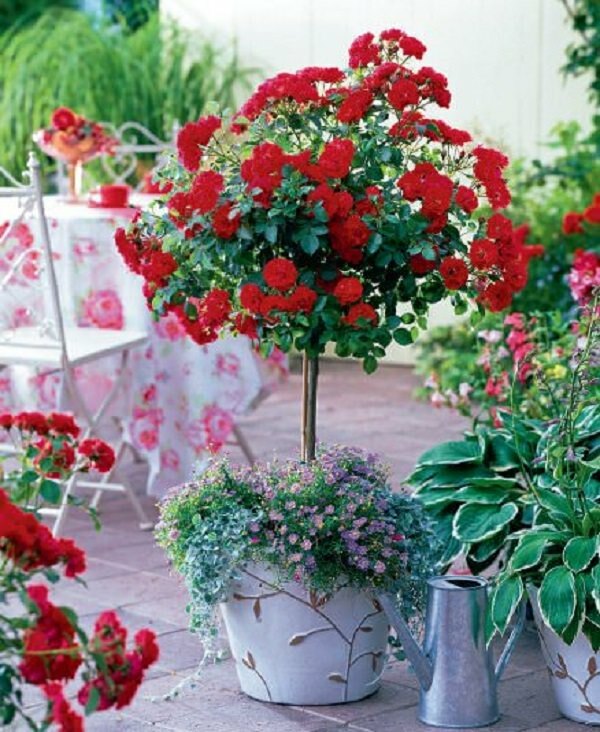 On a balcony, you can also grow miniature climbing roses such as red cascade, to use up your vertical space. Miniature Roses produces small flowers of about 1”-2” inch size in red, yellow, pink, white, peach, orange and many other colors. Generally, the bushes grow to no more than 18 inches in height. If you like large roses, grow hybrid tea roses. They flower less but phenomenal. One flower on a long, straight and upright stem. Hybrid Tea Roses can be as tall as 6 feet. Each bloom can be up to 5″ in diameter. Hybrid Tea Roses are one of the world’s most popular types of roses due to their color and large blooms. Floribunda roses produce a cluster of flowers on top of each stem, their blooms are smaller in compare to tea roses. These roses can grow up to 3 feet tall. Patio roses are undemanding small bushes, which grows between 18 to 24 inches tall. They have a compact growing habit and thrive well in containers. To learn more about rose varieties for containers read this post. The size of the container should be medium to large to grow rose bushes. Larger varieties require extensive, deep pot with a minimum diameter of 40 cm, with large drainage holes in the bottom. On the other hand, low growing, medium to small sized roses can be grown in containers with a diameter of 25 – 30 cm. Don’t overlook the look of containers, potted rose plants look more beautiful if you choose a handsome container for them. While choosing container look at their bottom for drainage holes, good drainage is essential for roses. If there is insufficient drainage, make some holes. Best time for planting roses is spring to early summer. After purchasing roses transplant them as soon as possible to new, larger pots as they usually are sold in very small containers. For the USDA zones 9 – 11 and other subtropical and tropical parts, rose can be planted from any time between fall (autumn) to winter. If you have bought bare root roses you should keep their roots submerged for an hour or two in the water, making them absorb the moisture, this will make them easier to adopt in a new place. Then put on damp root ball of your rose plant into the pot. While planting, ensure that rose placed in soil just deep as it used to grow in the previous pot. Water well the freshly planted roses and for a few days place them in a sheltered place that receives only a few hours of morning sun, later on, move the containers to the position that is sufficiently bright and receives the sun at least for 7 hours as no roses, in the long run, can tolerate shade. Throughout the season, roses in containers should be watered deeply and moderately because they do not tolerate desiccation. After about 2 to 3 weeks of planting, roses are ready to be fertilized. One thing you should know that roses are heavy feeders. Fertilize roses using the special rose mix fertilizer, which you can buy from a garden center, you can also fertilize them with any all-purpose fertilizer. Application of manure and compost also helps the rose plants. The main advantage of growing plants on a balcony is that it remains comparatively warmer than regular gardens. Still you should do some things to warm the pots and plants, do heavy mulching with organic matter and protect them from the cool air. In very low temperatures in winters, keep your potted roses indoors. Except North facing, you can grow roses on every type of balcony. Every spring or in the beginning of growing season replace the potting soil or at least replace the top layer with compost or manure. Always cut the faded flowers, this stimulates the growth of new buds. I have a rose tree which I planted outside. I’m going to bring it in for the winter. Should I keep it under a plant light? Thank you for the comment. Try not to keep it inside until possible. Keeping roses indoors is hard but not impossible. It’ll be less difficult if you have a window facing South, you can keep your plant there. Use grow lights too. Fluorescent lights in sets of four tubes a few inches above the plant. Somehow it’ll survive. You should also need to care about spider mites. Hi, your rose garden is beautifull! I live in a climate where summers are very hot and winters tend to be about 12 degrees celsius (sometimes colder). i plan on placing the rose pots in a patio that can be covered when it rains. my question is, will the rain coverege be sufficient as i wont be able to place the pots indoors? I have a long narrow planter with roses in it,but for some reason it doesn’t look very full or lush. I’ve spaced them every three feet and they bloom well, do I need to plant more roses or closer ?